GALION — Local, small business continues to arrive in Galion, with another arrival announced this week. Ohio Specialty Services Motor Ranch opened its newest location at 245 Harding Way West, just a few blocks west of the square in uptown Galion. 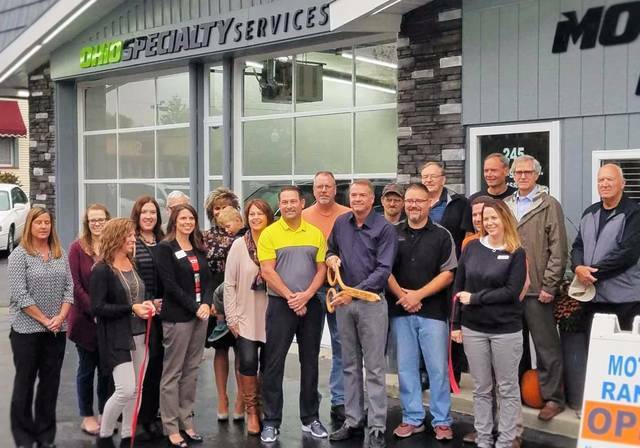 Jenney, along with general manager Colby Bright and manager Aaron Adams, officially opened for business Tuesday, Oct. 10 and held a ribbon cutting ceremony and open house Thursday. With at least 30 cars, trucks, minivans and everything in between on the lot as Tuesday, Jenney says that type of selection is what the community can expect. Jenney also has a motor ranch in Bucyrus at 1825 E. Mansfield St. and has plans to open locations in Marion and Chatfield. The Motor Ranch is open 9 a.m. to 5 p.m. Monday through Friday, with Saturday hours being 9 a.m. to 1 p.m.
For more information on Ohio Specialty Services, call 419-468-4000 or visit their website: ohiospecialty.com. Chad Clinger | Galion Inquirer The Ohio Specialty Services Motor Ranch in Galion is officially open for business after a ribbon cutting ceremony and open house with the Galion-Crestline Area Chamber of Commerce on Thursday morning. https://www.galioninquirer.com/wp-content/uploads/sites/38/2017/10/web1_OSSMR.jpgChad Clinger | Galion Inquirer The Ohio Specialty Services Motor Ranch in Galion is officially open for business after a ribbon cutting ceremony and open house with the Galion-Crestline Area Chamber of Commerce on Thursday morning.